Mike Flanagan just might be the newest name on my list of favourite people. His movies are imaginative in their approach to supernatural phenomena that exist on the periphery of our everyday world. In this way, his carefully crafted scares absorb even the most skeptical viewer. What I like about him is that he leaves room for mystery. Was it real or was it all imagined? We’re free to decide for ourselves, but if we’ve done our job and suspended our disbelief, the answer will be obvious. 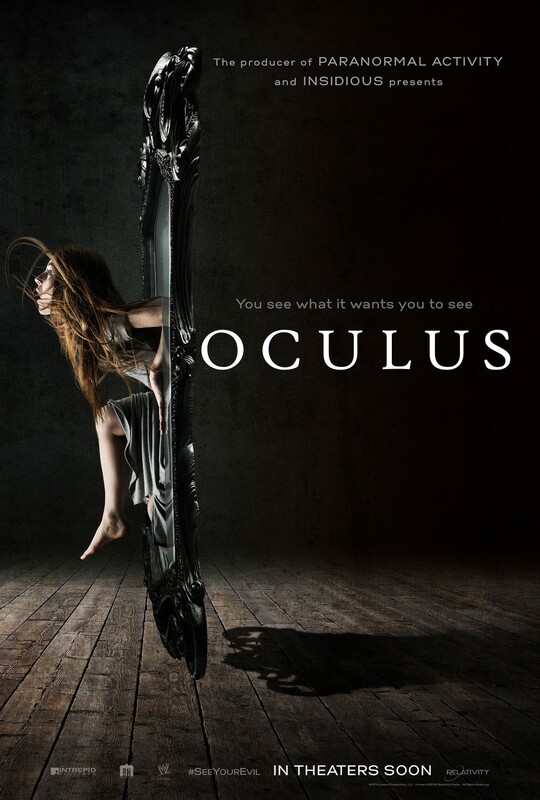 Oculus (2013) is Flanagan’s second feature following the festival hit Absentia (2011). Absentia takes a premise that would be fairly bland or even laughable under different circumstances, but Flanagan keeps the mystery going and imbues it with emotional depth and complex interpersonal relationships that give the film an almost spiritual resonance. Oculus does something similar. It takes its core premise from his 2006 short film “Oculus: Chapter 3 – The Man with the Plan”, and then builds a world with new, fleshed-out characters around the same basic concept. Essentially, it’s about a killer mirror, which could have been ridiculous had the writing been lazier. Lucky for us, that’s not the case. 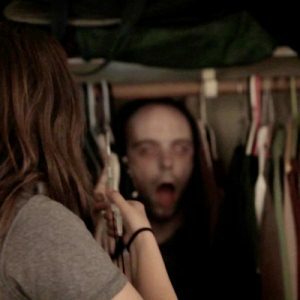 I recommend the short to anyone who has seen Oculus, for a great example of an effective, minimalist short film, but also a revealing look at how stories like this one are written, from a seed of an idea to a feature-length film. 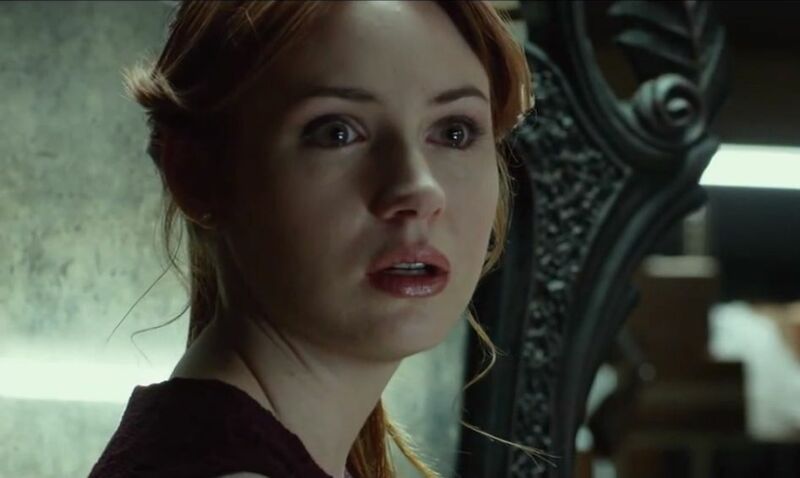 Oculus begins as a young woman (the captivating Karen Gillan) takes in her brother (Brenton Thwaites) who has just been rehabilitated and released from juvenile detention after allegedly killing their father (Rory Cochrane) some ten years prior. He considers himself justified but guilty, while she thinks the whole tragic series of events was due to the malevolent influence of the antique mirror that hung in their father’s study. Gillan has had plenty of time to research the mirror, and implicates it in dozens of cases of unusual and often self-inflicted deaths. I won’t spoil it by listing them here, but they’re the kind of brilliant two-line stories you might hear around a campfire, the ones that haunt you for weeks. She creates an elaborate and supposedly foolproof plan to catch the mirror’s evil on camera, thereby proving her family’s innocence, before destroying it forever. As she executes her plan, under the constant skepticism of her brother, the narrative is interspersed with childhood flashbacks that illuminate the mechanisms the mirror uses to drive its owners insane. It controls people by manipulating perception, by creating powerful sensory illusions in the minds of anyone within the mirror’s zone of influence. How do you destroy something that knows your every thought and feeling and can manipulate all five of your senses at any time? I’m often frustrated by the kinds of films that are acclaimed for “blurring the line between the imaginary and reality”, because those tend to be the kinds of films that indulge in spectacle at the expense of logic and coherent writing. While watching Oculus, there were times I had no bloody clue what was real and what was imaginary, but I knew I was in the capable hands of a well-crafted story, and the experience was incredibly satisfying. I think Oculus has a lot in common with the film 1408. Both movies have a slightly hokey premise (haunted mirror vs. haunted hotel room); a skeptical character as well as a believer; exposition scenes describing dozens of mysterious, self-inflicted deaths; a malevolent force that manipulates humans by altering their perception; and an epic, high-stakes battle for the human soul. I liked 1408, because hotel rooms are inherently a bit creepy, but I prefer the concept of the mirror and love the way it was integrated into the overall aesthetic of Oculus. The film is expertly crafted and permeates with metaphors of reflection. The narrative corkscrews its way through flashbacks that reflect and intensify the contemporary storyline until, finally, past and present become one and the same. The elegant camerawork creates the illusion that something is lurking just beyond the frame, something we long to glimpse at the edge of every panning shot. The sound design makes heavy use of echoes, which are not only creepy, but also the auditory equivalent of reflections. There is also a great deal of symmetry (a.k.a. mirror images) in the set design, most notably in Gillan’s curiously deliberate set-up of monitors and cameras to catch the evil mirror in the act. Speaking of cameras, technology is assumed to produce more reliable representations of reality than mirrors, when in fact all that either can do is capture light and present an indirect image of an unknowable reality. Photography, too, is eventually shown to be fallible. The human eye essentially does the same thing. None of us can fully trust the story told to us by our five senses, but it’s all we have to go on. And isn’t that terrifying? The difference here is that a tangible entity, a mirror, is to blame for the brother and sister’s deception, and that they are in immediate, mortal danger. At the best of times, mirrors are powerful and dangerous things. The French psychoanalyst Jacques Lacan identified a process of identity formation in infants that he called “the mirror stage”. The infant is uncoordinated and feels that the different parts of her body are fragmented. When she is old enough to look in the mirror and identify the reflection as her own self (the exact age at which this occurs will vary), she experiences a sense of “imaginary wholeness”. She can look at the reflection and say, “This is me”. From that point on, she constructs her identity as “I”, and strives to make her internal sense of self as unified as this external reflection (the “Ideal I”) appears. This is an exciting moment, since she has an “I” and knows that she exists, but it also comes with the frightening realisation that her fragmented self that was once intertwined with her mother’s body is now separate and distinct. She also develops a lifelong dependence on external validation, such as mirrors and the perception of other people, to define herself. Innocent introspection is replaced by external reflections. Mirrors, even non-haunted ones, turn people from subjects into objects. Jean-Paul Sartre would agree that this is the beginning of an oppressive situation for identity formation. In his play Huis Clos (No Exit), three people find themselves in hell, which is actually just a living room in which they are forced to spend eternity together, without sleep. They are forced to exist as objects in the perpetual gaze of the “other”, rather than as subjects within their own consciousness. With no reflective surfaces in the room, a vain young woman desperately begs the other characters to “be her mirror” by describing what they see when they look at her. This ultimately gives her no better sense of who she is. We need external validation at the same time as we suffer from it. “L’enfer, c’est les autres,” goes the famous quotation (“Hell is other people”). You are not yourself, you are located in someone else’s eyes, in the reflection of a mirror. Moving away from the intellectual and into the more obvious, mirrors regularly hurt us by facilitating a distorted body image. The film plays with the idea brilliantly. We’re used to women looking in the mirror and seeing themselves as fatter, uglier, or older than they actually are. But this mirror can actually make you hallucinate your husband calling you a “grotesque cow” and make you think he’s having an affair! This happens to the mother character (Katee Sackhoff) who succumbs to the mirror’s power, gazing into it obsessively. How’s that for distorted body image! Oculus works because it plays on major human fears, the most obvious being a) dying, b) people we love dying, and c) physical and emotional pain. But those three fears alone aren’t what make Oculus interesting. Having a mirror as its villain means bringing out existential fears like d) not being able to trust your senses, and e) not being real. Any minor gripes I have with the film are redeemed by the sheer effectiveness of the central metaphor and the engrossing story. I can’t wait for Somnia, the next horror film from Flanagan, a talented filmmaker with a peculiar fondness for Latin titles. But dammit, Flanagan, enough with the stretch-face ghosts with strange eyes. You don’t need them. You are better than that. See you later, and hopefully much more frequently.